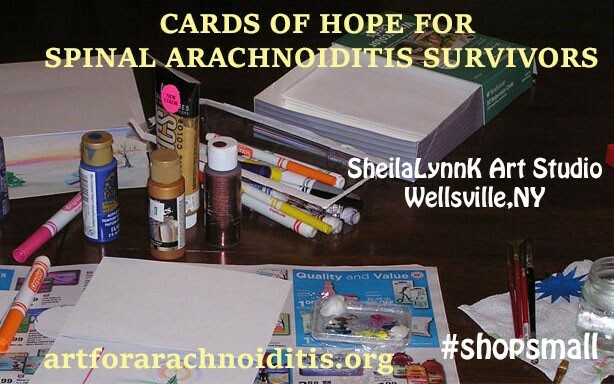 HANG OUT FOR A WHILE TO MAKE A HOPE CARD FOR A SPINAL ARACHNOIDITIS SURVIVOR (Supplies provided) Arachnoiditis is a preventable spinal cord injury caused by the neurotoxins in spinal injections and invasive spinal procedures. By submitting your card you grant permission for your work to be shared in the public and private aspects of this project. Your work may appear in the Online Gallery at artforarachnoiditis.org, in The Survivors' Art Exhibit (now pending funding), or on the Art For Arachnoditis Project Facebook page and other social media listings for the project. The Art for Arachnoiditis Project has served 445 Survivors since 2014. Our website for Survivors served 93 countries in 2015. November is nerve pain awareness month, #NERVEmber.